Bacteria. The word alone conjures up the unhygienic and the unfavorable. But these little guys are misunderstood. Not all of them are bad. And like any good anti-hero, the good bacteria are waging an epic war against the bad guys – and they’re doing it right inside our gut. We boast a massive 100 trillion microorganisms 1 in our intestine, which is about ten times greater than the number of cells in our whole body. In other words, the bugs in our gut may be tiny, but they outnumber us 10 to 1. While that sounds deeply disturbing, it also means we need to pay attention to them. Not only are they strong in number, but they also have a role to play in maintaining our good health. Our gastrointestinal system contains over 400 different species of bacteria, with their colonization in our gut starting immediately after birth 2. The good bacteria wear many hats, they do everything from preventing bad pathogens from colonizing our gut, make up more than 75% of our immune system, help us to break down food, produce vitamins (biotin and vitamin K), and much more. 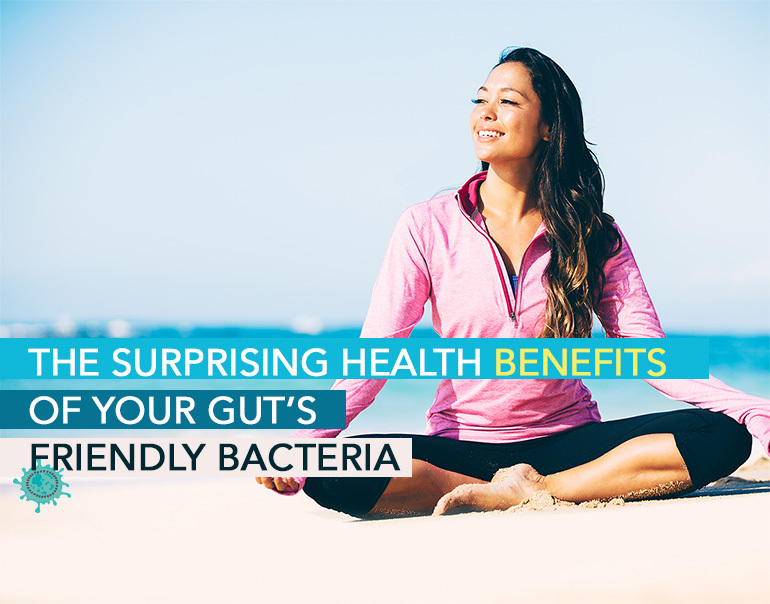 The benefits of good bacteria go way beyond just gut health. Keep depression at bay. 3 Nope it’s not farfetched: more and more research is showing a link between the brain and the gut. When the gut is inflamed, it promotes the release of inflammatory cytokines in the blood. These substances can then induce inflammation in the brain, creating symptoms of depression. By preventing gut inflammation, healthy bacteria can prevent, or at least, minimize brain inflammation, thus improving symptoms of depression. Improve oral health. Your digestive tract starts with your mouth and it’s only logical that good bacteria can affect your oral health. Studies show that the friendly bugs in your mouth produce hydrogen peroxide as well as other antimicrobial substances that suppress the growth of harmful bacteria 4. Reduce acne. It’s been said that our skin is the window to our gut (and liver). In fact, since the 1930s, dermatologists suspected that the skin’s health ‎depended on that of the gut 6 and recent studies now back this ‎ up. Researchers explain that a healthy gut can prevent small intestinal bowel overgrowth (SIBO), a condition in which bacteria invade the small intestine where they don’t belong and cause a cascade of health problems and share many symptoms with irritable bowel syndrome (IBS). When the good bacteria start losing the battle against the bad bacteria, this delicate bacterial community goes awry, and almost everything goes haywire. Weight gain. Lab studies in mice show that bad bacteria are able to induce low grade inflammation, leading to overeating and insulin resistance. 9 When scientists in the study transferred the gut flora of obese mice into the guts of skinny ones, the skinny mice started eating excessively and also became obese. A similar experiment used human twins in which one twin was obese and the other slim. This time they transferred gut bacteria from the twins to the mice. The mice that got bacteria from fat twin grew fat, while those that got bacteria from the slim twin stayed skinny. In another study, researchers found that having an unhealthy balance of gut flora increased the rate at which carbs and fatty acids are absorbed from food, and that more calories were stored as fat. 10 What this means is that someone with an unhealthy balance of bacteria in the gut could eat the same foods and the same amount of food as someone with a healthy balance of gut flora but gain more weight, because they are converting more of the calories they eat into fat. Diabetes and fatty liver. The mice from the study above also developed full-blown diabetes and fatty liver solely because their gut flora was adversely affected 9. Increased risk and severity of inflammatory bowel disease. Researchers found that when harmful microbes are allowed to colonize the gut, they activate the mucosal immune system and cause inflammation. This inflammatory cascade injures intestinal cells causing lesions in the bowel 2. Poor oral health. When the delicate flora in the gut is disrupted, or not strong enough to keep pathogenic bacteria out, tooth decay, gingivitis and halitosis (bad breath) can occur 4. Increased susceptibility to developing acne. Russian scientists also found that ‎54% of acne sufferers have significant alterations to their gut flora 13. In fact, individuals suffering from SIBO are 10 times more likely to suffer from acne rosacea 14. When the gut flora is disrupted and causes SIBO, digestion is compromised leading to digestive distress and inflammation which, in turn, further damages the intestinal linings enabling pathogens to migrate even more freely in the upper gastrointestinal tract. These effects can compromise the skin’s integrity and protective functions 14. 1. Eat a ‘clean’ diet, one that contains few processed foods, refined carbs and soy products. 2. Increase your consumption of fermentable fibers. 3. Eat more berries, herbs, spices and vinegar. Scientists have found that the phytochemicals in these foods are effective quorum sensing inhibitors (QSIs). QSIs prevent bacteria from recognizing the exact size of their colony causing less biofilm is produced. The bacteria cover themselves with biofilm, a protective slime that acts like a force field, to protect the bacteria colony against our immune system, antibiotics and friendly bacteria species 15. So, less biofilm means that our friendly bacteria and immune system can better fight the bad bacteria, as their force shields are effectively down. 4. Reduce your consumption of oils such as canola oil, soya bean oil, safflower oil, corn oil and peanut oil as these can lead to a leaky gut. 5. Exercise regularly to control stress. You don’t have to hit the gym if that’s not your thing, simply do something you enjoy. 6. Take a high quality probiotic. However, if the bacteria in your gut is seriously out of whack, it would be more effective to kill the pathogens first by taking an antibiotic (talk to your doctor about this). Once the infection has been cleared, you can proceed to restore and enhance your gut flora using pre- and probiotics. You can also consider more drastic methods such as bacterial replacement therapy – talk to a gastroenterologist to find out if you’re a potential candidate. Bäckhed, F., Ley, R. E., Sonnenburg, J. L., Peterson, D. A., & Gordon, J. I. (2005). Host-bacterial mutualism in the human intestine. Science, 307(5717), 1915-1920. Gill, H. S., & Guarner, F. (2004). Probiotics and human health: a clinical perspective. Postgraduate Medical Journal, 80(947), 516-526. Dinan, T. G., & Quigley, E. M. (2011). Probiotics in the treatment of depression: science or science fiction?. Australian and New Zealand Journal of Psychiatry, 45(12), 1023-1025. Bonifait, L., Chandad, F., & Grenier, D. (2009). Probiotics for oral health: myth or reality?. Journal Canadian Dental Association, 75(8), 585. Lodinová-Zádníková, R., Cukrowska, B. Z. E., & Tlaskalova-Hogenova, H. (2003). Oral administration of probiotic Escherichia coli after birth reduces frequency of allergies and repeated infections later in life (after 10 and 20 years). International archives of allergy and immunology, 131(3), 209-211. Kalliomäki, M., Salminen, S., Poussa, T., Arvilommi, H., & Isolauri, E. (2003). Probiotics and prevention of atopic disease: 4-year follow-up of a randomised placebo-controlled trial. The Lancet, 361(9372), 1869-1871. Vijay-Kumar, M., Aitken, J. D., Carvalho, F. A., Cullender, T. C., Mwangi, S., Srinivasan, S., … & Gewirtz, A. T. (2010). Metabolic syndrome and altered gut microbiota in mice lacking Toll-like receptor 5. Science, 328(5975), 228-231. Vattem DA et al. (2007) Dietary phytochemicals as quorum sensing inhibitors. Fitoterapia; 78(4):302-10.